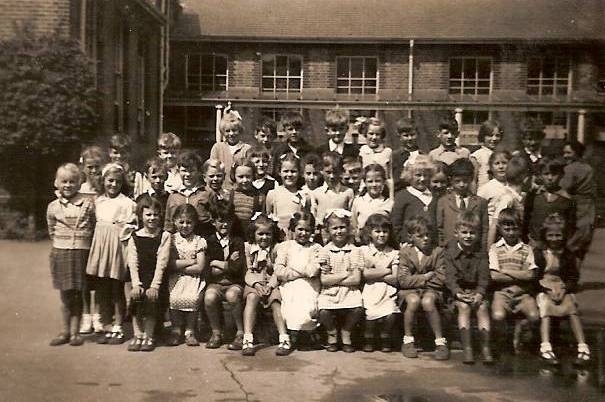 You are here: HomenextPlacesnextSchoolsnextCoombe Road Primary SchoolnextIs this the class of 1953? I really don’t know anything about this photos – the date is actually a guess. Maybe someone can help me out? Anyone recognise themselves? I recognise Vivien Ashdown, Jackie Holliday, Judith Nye, Sally Berry and Linda Pullen. I know some of the other faces but I wasn’t in this class and can’t quite remember the names. Most of us lived in the local community and were neighbours. I have been looking at this photograph again and am a bit puzzled, it seems it has different age groups in it. Vivien Ashdowne was in the year above me, whilst Jaqueline Towner was in the year below me. Also, the class is too large and ill-prepared to be photographed (one boy turning round and a teacher on her way to the verandah). Would be interesting to know the circumstances. I am also a little puzzled as I think the girl with bunches in the middle row, slightly right of the middle is me! However I don’t recall any of the others! I would have only been about 4 then, so if it is me, I was born 1949 and I would have been perhaps 6 or 7 in the picture, which makes it around ’55 or ’56.